BA Fine Art graduate Naomi Nehemen Palacios reflects on how her nomadic upbringing has influenced her art and how she hopes to confront injustice by tackling stigmas associated with certain groups in society. Born into an immigrant working-class family, Naomi Nehemen Palacios spent her childhood constantly on the move, from London to Nice and Chile. “It was difficult to ever feel home and fit in,” the Middlesex BA Fine Art graduate recalls of her formative years. Unsurprisingly, it is these human experiences that have influenced her unique brand of performance art. “My current performance pieces take on a theatrical side to draw in the attention of the audience, but also to highlight people’s social reactions,” says Naomi. 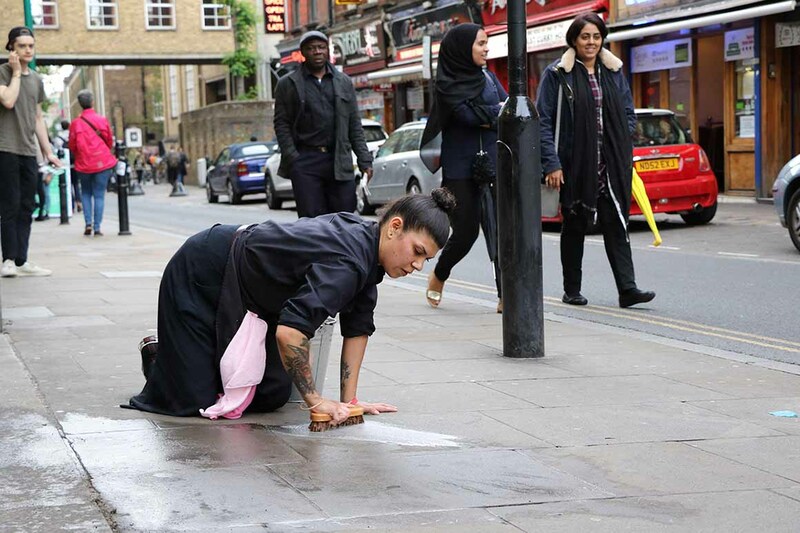 At the recent New Wave graduate exhibition at the Old Truman Brewery in Shoreditch, the 26 year old took her art outside – spending an hour on her hands and knees scrubbing the pavement in front of the row of Indian restaurants on Brick Lane to bemused and sometimes angry reactions from tourists and passers-by. “Why are you doing that?” one agitated woman exclaimed. Back inside the cavernous east London venue, among the more traditionally displayed art of her peers, she sat motionless on a stool in front of a long cord. Curious exhibition-goers who pulled it – causing a bell to jangle – were then dusted down by a straight-faced Naomi, who has the ability to not break character no matter how the audience reacts. “What has provoked me to create these performances is to bring awareness to the stigmas people attach to other members in society,” she explains. In another performance piece, she spent several hours, largely ignored, cleaning the windows of an art gallery. But while many of her works involve taking on the role of the invisible labourer, Naomi is also not afraid to engage directly with an audience – ‘Fight of Flight’ saw her arm wrestle with a succession of men, captured by a dramatic overhead video.